SHIPS AS SHOWN IN PHOTO, NO ADDITIONAL OUTER PACKAGING. The item "KitchenAid 4.5 Qt. 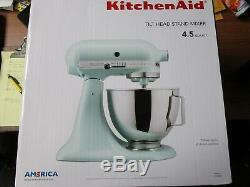 Tilt-Head Stand Mixer KSM961C Ice Blue BRAND NEW" is in sale since Thursday, January 24, 2019. This item is in the category "Home & Garden\Kitchen, Dining & Bar\Small Kitchen Appliances\Countertop Mixers". The seller is "evanleigh2010" and is located in Crestline, Ohio.